Microsoft has showcased a new form factor for Windows 10 devices, one that can actually be squeezed into a plug. The Quanta Compute Plug was demonstrated by Microsoft's Nick Parker during his Computex keynote address in Taiwan. 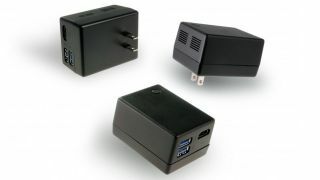 The mini-PC comes with two USB 3.0 ports and an HDMI port, allowing you to turn your TV into a smart computer. Users can control their TV using Cortana via a Bluetooth remote or headset. Parker didn't mention what version of Windows it will run but it is safe to assume that it will be a full Windows 10 model rather than Windows 10 for IoT. The Windows ecosystem is following what Android and Linux had done before. Intel recently embraced the stick form factor with the Intel Compute Stick, something that Android users first discovered about four years ago thanks to HDMI dongles. As for the power adaptor, Marvell introduced the Linux-powered SheevaPlug back in 2009, one that obviously used an ARM system-on-chip. Quanta doesn't sell computers but is one of the biggest so-called original design manufacturers (or ODM) worldwide. In other words, they build stuff for others (think HP, Dell, Apple) to sell. The next step would obviously be to get a computer in a switched socket, eliminating the need to plug anything in the first place. The best all in one computers in the UK, compared.